Black Bear Cabin - A cozy cabin with a hot tub! Includes Biltmore! A Featured Dog-Friendly Property: Your Dog Stays for Free at Black Bear Cabin! From one dog lover to another, the owner of this property is waiving the pet fee for one dog! You'll appreciate the convenience of being able to cook your own meals in the Fully Equipped Kitchen and eat-in while on vacation. Cozy up by one of two gas fireplaces, one in the living room, the other in the lower level living area, where you'll love watching the 55-inch TV with satellite service and stereo surround sound. End the day with a visit to the creekside outdoor entertaining area and then a bubbly soak in the 2-person hot tub! Bonus: there's a fenced-in yard that's just right for your furry friends. 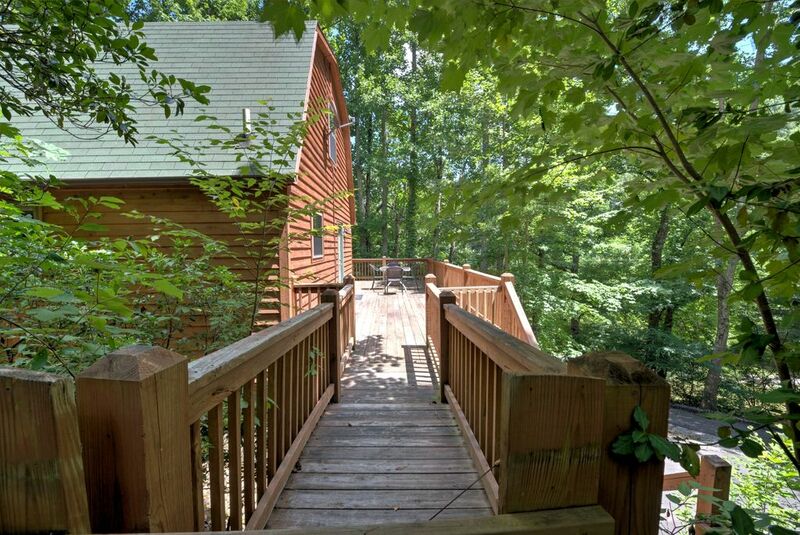 This vacation rental is located in Black Mountain and is approximately 30 minutes to downtown Asheville. • Limited Internet: This property has extremely limited internet service. Please note that it cannot be used for video calling, transferring files, or streaming music or movies. The internet service is only available for basic web browsing and checking emails. This Is a Pet-Friendly Property -- Please Read this Important Information! We love our furry friends! If you'll be bringing your dog(s) with you, tell us how many (max. 2 dogs) and their weight. Thanks! • $85 pet fee waived for one dog per reservation! There is a non-refundable pet fee of $85 for a second dog (plus taxes). • Note that the pet fee will not be included in your total rental amount. Your payment is due directly to Carolina Mornings Vacation Rentals. • A Vacation Planner from Carolina Mornings Vacation Rentals will contact you within 72 hours of acceptance of your booking to collect the pet fee. • Failure to pay the pet fee may result in cancellation of your reservation. • The pet fee is required; undeclared pets are subject to a penalty fine per the rental agreement terms. • The pet policies for this vacation rental, which can be found in your rental agreement, should be reviewed PRIOR TO BOOKING. This vacation rental comes with a with an exclusive Mountain Discovery Pass from Carolina Mornings Vacation Rentals, including a Biltmore Estate pass and seasonal activities such as ziplining, whitewater rafting, and skiing - a special gift not available anywhere else! 2 Gas Fireplaces, Covered Porch, Expansive Deck, Mountain Views, 2 person Outdoor Hot Tub, & Roaring Creek at property edge, Dogs allowed with additional $75 Non-refundable Fee. Very charming and roomy cabin. Easily accessible. Great getaway for petowners. Cabin was very nice for our family of four and 2 dogs. Fun paths to explore and nice privacy. Would definitely recommend! The property was very nice but there could be more updates to the property. The beds are very uncomfortable. Otherwise, the property is very nice! Great Getaway near Black Mountain and Asheville! This is a perfect escape from the bustle of the suburbs, yet close enough to Asheville's offerings. Our dogs love coming here and walking along the creek as we love sitting off the deck hearing the water. The three different levels is great for family to spread out but still be near one another. Very clean and nicely furnished. Can't wait until we can come again. Thanks again for a wonderful getaway at Black Bear. Complimentary Mountain Discovery Pass with all reservations! One free pass to each amenity, each paid night. Available amenities vary per season and include: Golfing at Reems Creek, Ski Lift Ticket at Ski Wolf Ridge, Whitewater Rafting, and LaZoom City Bus Tours. Non-refundable Pet Fee @ $85 per dog. *Plus 7.75% NC sales tax and 4% County occupancy tax. *Travelers Insurance optional at 7% of total reservation cost. and Wolf Ridge Ski Resort lift pass.